Companion reign : 1964 – 65. Vicki Pallister (played by Maureen O’Brien) met the first Doctor in The Rescue – 1965. Having been one of the only survivors, (along with a man called Bennet) – of a crashed starship on the planet Dido. 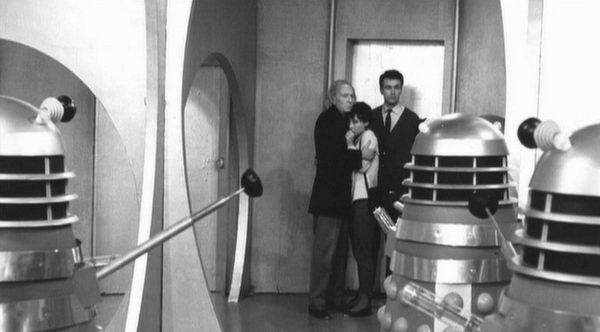 Bennet was unmasked as a dangerous criminal – and after his death, the First Doctor took pity on Vicki and invited her to travel. Like Susan before her, Vicki was a remarkably bright girl who was schooled in the 25th Century and was very technologically savvy. Immediately, this caused tension between Vicki and Barbara (the Doctor’s other companion) – being a learned 20th Century school teacher. On top of this, Barbara killed Vicki’s alien pet lizard with a flare gun in The Rescue – 1965, believing it to be a dangerous. They bickered frequently, as Vicki seemed to enjoy teasing Barbara about her superior schooling and knowledge – from the 25th Century; with all of its technological advancements. Vicki became closest to new companion Steven Taylor, following Barbara and Ian’s departure and acted as Steven’s moral outlook to her impestious and headstrong male counterpart. In The Myth Makers – 1965, the Tardis travelled to the city of Troy on Earth; during the Trojan War. Vicki fell in love with a Trojan Prince; named Trollias and left the Doctor, staying behind as the Tardis left. Like Susan before, Vicki was a ready-made replacement for the role of Doctor’s Grand-daughter. And like Susan, Vicki didn’t receive much meaningful characterisation or screentime. After a season and half, actress Maureen O’ Brien decided to leave the show. Steven Taylor (played by Peter Purves) met and became a companion of the First Doctor – in The Chase – 1965; as a captive of a robotic race known as the Mechanoid’s. Steven had been in the Earth Military (of the future), flying space missions but had crashed on the planet Mechanos. Kept in solitiude for 2 years and having not seen another human being; he kept a toy panda for company, nicknaming it ‘Hi-Fi’. After a battle, involving the invading Daleks; in which his Mechanoid captors were destroyed. Steven escaped and stumbled into the Tardis (unbeknown to the Doctor) and collapsed unconcious. Steven was very much in the mold of Ian but younger and more rash and headstrong. He was also intelligent and loyal too. He also had a good sense of humour and developed a good rapport with long-time companion Vicki. Steven had trouble accepting that time-travel was real ( The Time Meddler – 1965). In The Myth Makers – 1965 the party landed during the Trojan war. Steven borrowed the Greek name ‘Diomede’ (bravery), and was badly wounded in a sword fight with Trojan soldiers – fighting for the Greeks in Troy. He also got ill in The Ark – 1966 having contracted a cold virus from new female companion; Dodo, having had no prior exposure or immunity to it. Steven was lucky to survive, after descending into a raging fever. Steven even got the chance to try his hand at singing ballads at gunpoint in the Last Chance saloon in Tombstone, Arizona, 1881 in The Gunfighters. Steven left the Doctor at the end of the The Savages – 1966 having agreed to stay and help a civilisation rebuild itself. Steven and Vicki were easy-going and likable replacement companions for Ian and Barbara.